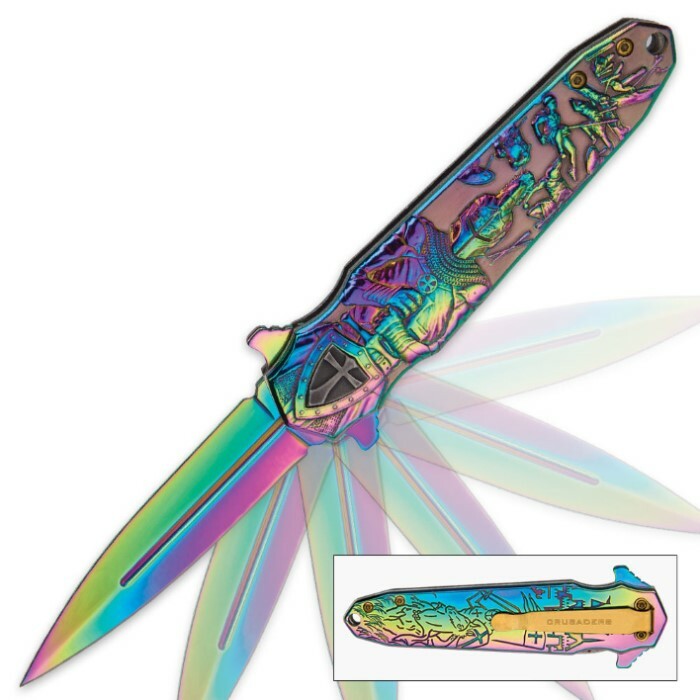 Crusader Blood Oath Assisted Opening Stiletto Pocket Knife - Iridescent Rainbow Finish | BUDK.com - Knives & Swords At The Lowest Prices! "Go medieval" on any foe with the bold, beautiful and ever-menacing Crusader "Blood Oath" Stiletto. 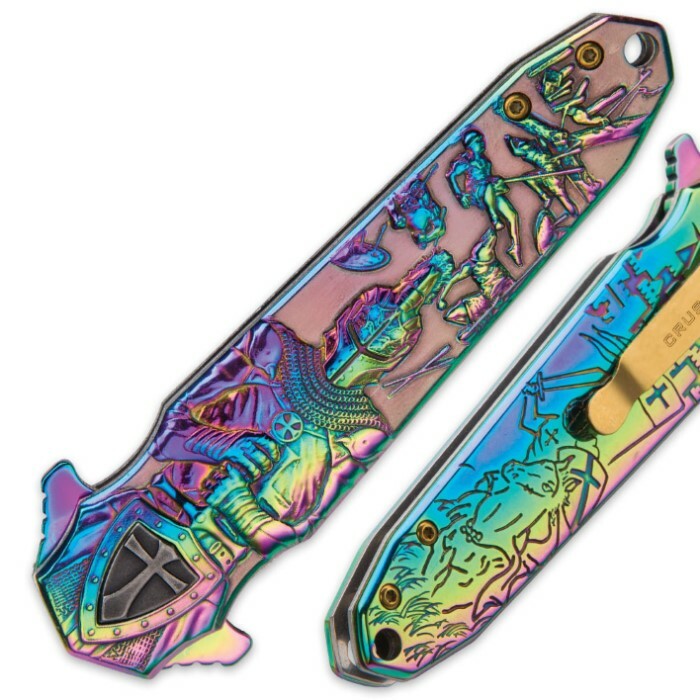 This unique assisted opening pocket folder features iridescent rainbow-finished metal alloy handle scales exquisitely cast with a collage of Middle Ages Crusades-themed imagery. On the front - in stunning raised 3-D relief - a knight in full shimmering armor clutches a longsword and shield studded with a handsome antique pewter-finished cross inset. A battlefield scattered with the bodies of fallen, spear-struck knights is rendered above. The back of the handle features engravings of a knight riding a stately steed and a medieval-style castle. Firmly nudge the handy flipper, and the 3 1/2" stainless steel stiletto blade deploys with impressive haste, thanks to the Blood Oath's smooth assisted opening mechanism. 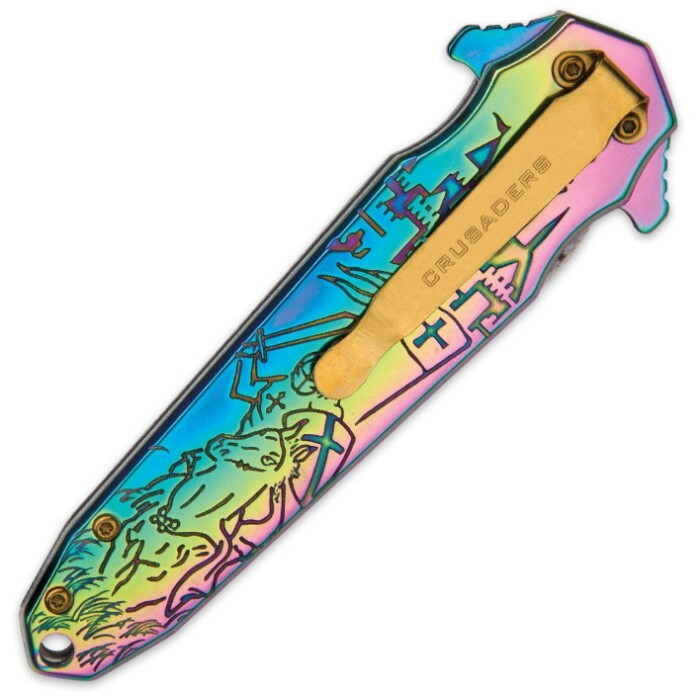 The rainbow-finished blade boasts a razor sharp cutting edge and a sleek false edge for aesthetic continuity. A sturdy liner lock keeps the blade fixed in the open position during use. At 5" overall, the stout Crusader Blood Oath Stiletto is easy to transport, especially with the integrated pocket clip and lanyard hole. As incredible as it looks, however, it's also well suited for display. Thankfully, at this price you can afford to get two - one to carry and one to showcase! Cant beat it for the price good quality and looks dope too!